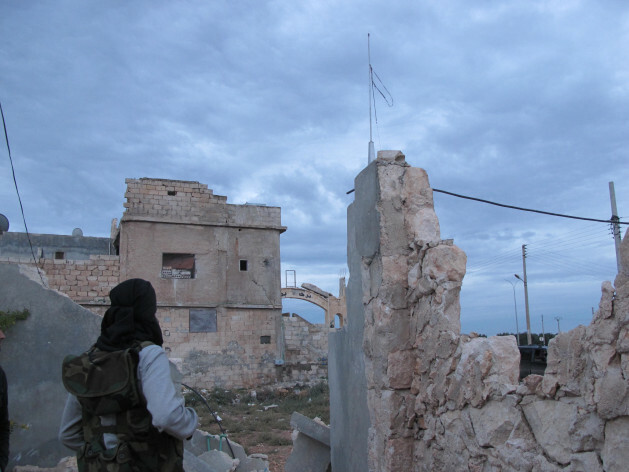 A member of the Free Syrian Army at the entrance to Sarmeen. Credit: Shelly Kittleson/IPS. LUCERNE, Switzerland , Sep 12 2013 (IPS) - Refugee rights organisations are demanding an EU-wide temporary protection regime for Syrian refugees. The announcement by some countries that they can take a few thousand refugees is not enough, the groups say. Sweden has announced a few steps after the number of Syrian refugees seeking shelter abroad has crossed the two million mark in early September. “The conflict will continue for a long time ahead,” said Fredrik Beijer, director of legal affairs at the Swedish Migration Board. Sweden decided to grant permanent residence to about 8,000 Syrians who currently hold temporary residency permits, and to facilitate family reunification. Germany and the Scandinavian country have between them received about two-thirds of the Syrian refugees fleeing to Europe. Since early 2012, approximately 14,700 Syrians have asked for asylum in Sweden. In August alone, 1,201 Syrian asylum-seekers arrived in the country. A comparison with the Bosnian war between 1992 and 1995 makes today's numbers look dismal. On Sep. 11, 107 Syrian refugees were flown out of Lebanon to Hanover as part of a temporary admission programme announced by the German government earlier this year. Having committed to 5,000 places, Germany currently runs the biggest refugee relocation programme for the Syria crisis. In June, the UN Refugee Agency (UNHCR) appealed for 10,000 humanitarian admissions. A group of countries including Denmark, Finland, the Netherlands, Norway and Spain have pledged 960 admissions for 2013 so far. Germany’s two smaller neighbours Switzerland and Austria have pledged to accommodate 500 refugees each. Austria’s foreign minister preference for Christian refugees recently drew harsh criticism. Compared to the hundreds of thousands of Syrian refugees stranded in Turkey, Lebanon, Jordan, Egypt and Iraq, the estimated 40,000 that have applied for asylum in Europe since April 2011 is peanuts. A comparison with the Bosnian war between 1992 and 1995 makes today’s numbers look dismal. At the time, Germany hosted 350,000 Bosnian refugees, Austria 90,000 and Switzerland nearly 30,000. During the Kosovo war, Germany evacuated more than 15,000 refugees, while Switzerland sheltered 53,000 and Austria 5,000. The Swiss chapter of Amnesty International calls Switzerland’s present offer “a drop in the ocean.” Austrian and German refugee rights organisations have also criticised their governments. In addition to the 5,000, several German states have announced they will permit up to 1,000 Syrian refugees to stay with their Germany-based relatives. Kopp said that many of these have been trying desperately to get their relatives to come over. Bureaucratic hurdles for family reunification are high, as Syrians already living in Germany have to prove they can provide for their relatives, host them and pay for their health insurance. “Most of them are unable to do so. But humanity mustn’t fail due to lack of money,” Kopp said. While Switzerland is facilitating family reunification, too, Austria hesitates to do so. In Austria, upcoming parliamentary elections reduce the willingness of politicians to invite refugees to the country. Meanwhile, thousands of Syrian refugees are trying hard to find a way into Europe. According to the Italian interior ministry, 3,000 Syrians have already arrived in Italy since the beginning of the year, most of them in boats. At Europe’s other entry gate, Greek coastguards have repeatedly been accused of pushing Syrian refugees back into Turkish waters. Anny Knapp, president of the Austrian refugee rights organisation Asylkoordination Österreich says refugees have to turn to the risky and expensive services of people smugglers, as no legal escape routes exist. “In addition, the Dublin regulation forecloses that refugees can profit from family or community ties in other European states,” says Knapp. According to the Dublin regulation, immigrants may be sent back to the country through which they first entered the European Union. Knapp’s German counterpart Karl Kopp therefore demands freedom of movement for Syrian refugees within Europe. Judith Sunderland, senior researcher at Human Rights Watch told IPS that Syrians seeking asylum in other EU member states face a protection lottery, with their fate depending on which country they reach first. All refugee rights advocates agree that action at the European level is required urgently. The European Commission also promised to continue efforts to ensure a greater degree of convergence between member states’ approaches to the Syrian refugee crisis. Yet it is far from providing a concerted solution like a EU-wide temporary protection regime, repeating its failure during the Libya war in 2011.